CASE STUDY VOLUNTEERS NEEDED FOR ‘EXPLORE WITH SOUND RESEARCH’ BETWEEN JANUARY AND MARCH 2017! Come and join me for this unique opportunity. 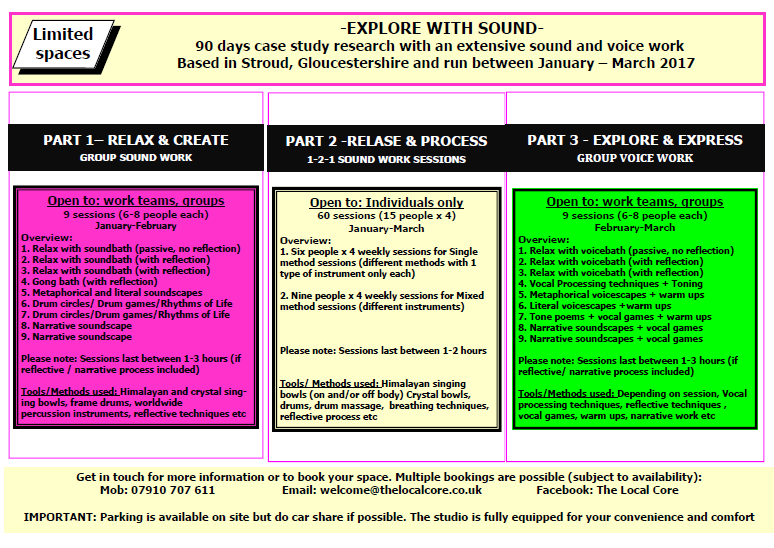 Become part of an extensive ‘Explore with Sound’ research project run in Stroud, Gloucestershire over the next 3 months. 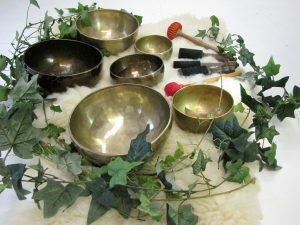 It is a great opportunity to try and experience various specialist sound instruments from around the world (tonal, percussive and melodic), as well as voice techniques and sound methods, combined with balanced rhythms, gentle breath and movement practice, person-centred reflective processes, visualisation, improvisation, vocal and sonic team building games and much more. It is the final step in acquiring my full extensive qualifications in therapeutic sound and voice work (up to practitioner level), and I am very pleased to launch it under the umbrella of my new business venture, The Local Core and introduce some of my creative work to a wider audience. Workshops are tailored for Individuals, Work Teams/ Diverse Groups both in the voice and sound area (dependent on your preference). There is something for everyone to choose from. 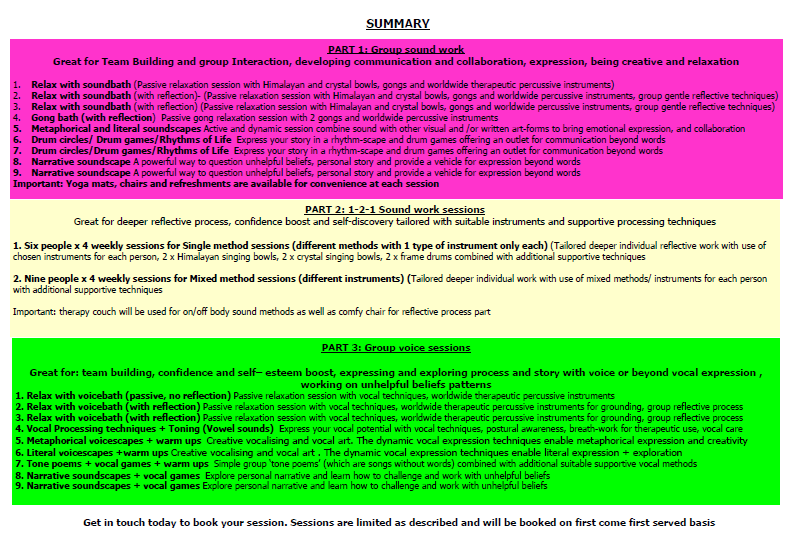 Please refer to the Summary Schedule below or click on the link to download a PDF version. Your Team/ Group is welcome to join for multiple different sessions. Individual workshops are offered as 4 consecutive weekly sessions only. There is no cost as such for participating in any of the workshops (although small voluntary one-off donations up to a maximum of £5 are welcomed if anyone wishes to do so, but this is entirely at your own discretion and individual choice). What is more important for me is to offer it to those who will benefit the most, who wish to make a difference in their local communities and workplaces, plus are willing to give their feedback and actively engage to advance my work going forward. Let me know if that interests you in any way or if you need more information. Flexibility with making arrangements is possible throughout the week. Pass it on! If you know anyone who might be interested or could benefit, please let them know. I welcome applicants from diverse backgrounds (non-vulnerable adults) and all walks of life. All participants will receive an unpublished sonic gift created especially for this occasion, as a way of thanking you for your commitment and participation. I look forward to hearing from you and to hopefully working with you on this research project.